An adolescent girl offered the chance to live in a world darker than her moods. A young boy able to see the dead. An outcast tribe of creatures just trying to survive among humans.And a boy struggling to redeem the honor of his parents while battling his mystical heritage. 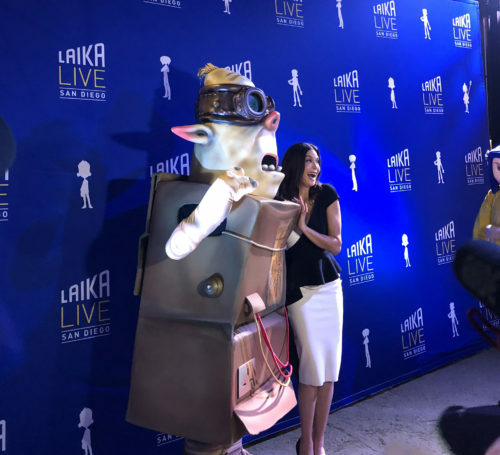 What binds the LAIKA filmography together is a commitment to surprising storytelling, and visual creativity unmatched by other kinds of animation. 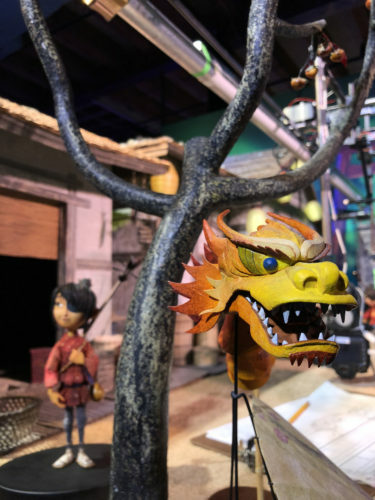 Hand-made and painstakingly animated, LAIKA films have a tactile edge and reminders that if you feel like you don’t belong, you still belong somewhere. Maybe that’s glib, but there’s something about these films that stick to your ribs, and so getting a chance to see how it all ticks is an opportunity that’s hard to pass up. 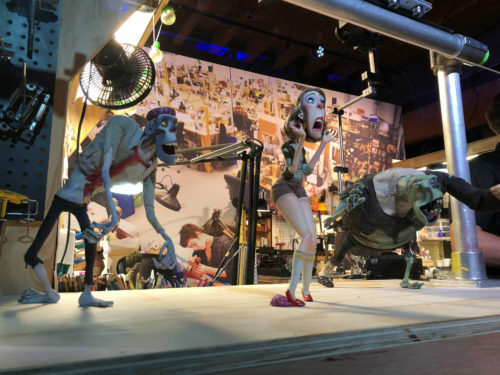 Since last weekend, LAIKA has taken over the space at 350 5th Avenue in San Diego, and filled it with displays of the studio’s artistry (as well as, understandably, a gift shop). It’s open from 10 a.m. to 10 p.m. Thursday, until 11 p.m. Friday and Saturday, then, just after Comic-Con ends, it will close Sunday at 6 p.m. Though tied to Comic-Con, it’s open to everyone, not just badge holders. 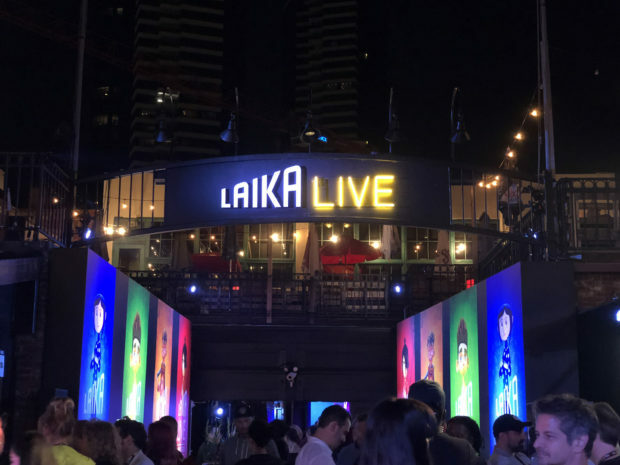 Passing through an entryway lined with character posters reminding fans of LAIKA’s past, you can also stop and watch a short documentary on a large screen. Before seeing the results of the craftsmanship up close, it’s interesting to follow the painstaking steps to create screen magic. 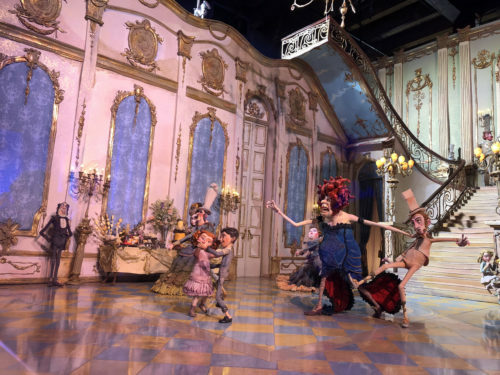 In the main gallery, the company has sculptors and animators occasionally giving tours, but there you see more of the final product. The effort going into creating tiny lights, plants, everything — there’s just no time for someone to work on it in the Gaslamp District. 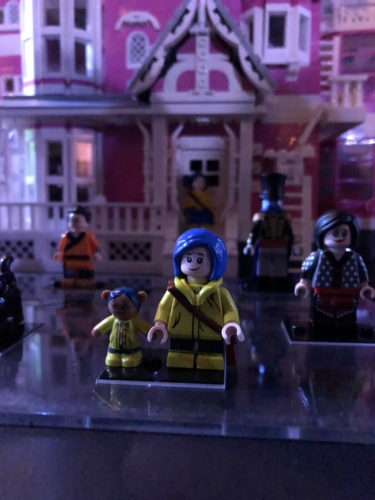 Also note there’s a prototype of a LEGO set recreating the main house from Coraline — the studio asks that if you like it, you vote for it on LEGO Ideas. 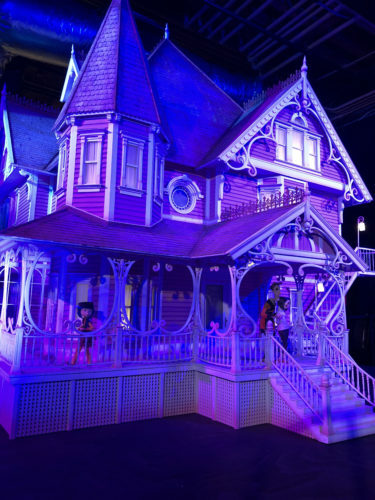 Then it’s in to an astounding gallery, featuring the actual house itself, “peopled” with characters from Coraline. It doesn’t just draw the eye — it’s so massive you can’t see past it, until turning the corner and taking steps behind the scenes. 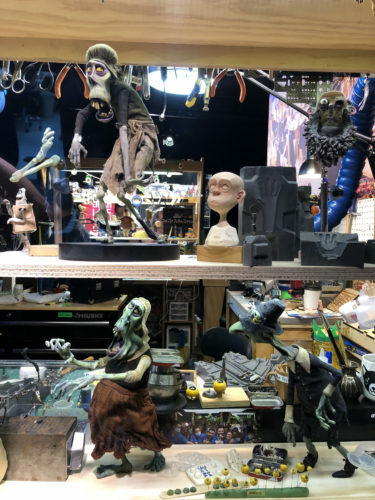 The second focus is on Paranorman and Kubo and the Two Strings, with props in various states of repair, and a display of multitudes of faces used to evoke emotion on the characters. 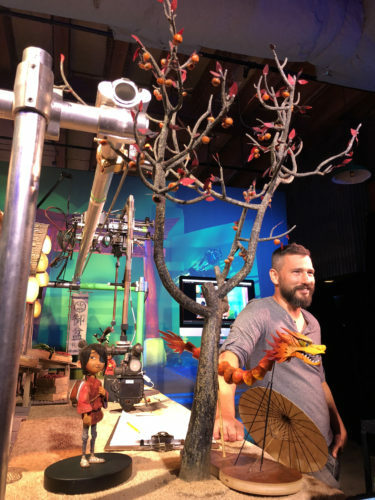 Kubo stands on a set, ready to be photographed, and an animator is on hand to talk guests through the process. 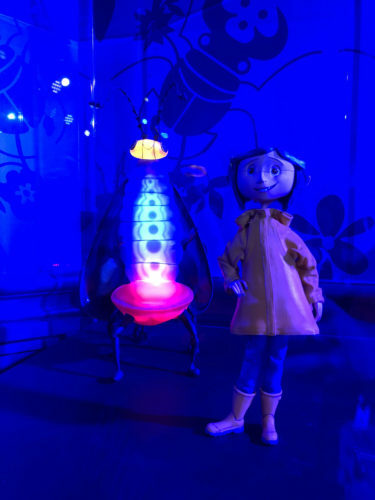 Of course, there’s more Coraline. It is, after all, the 10th anniversary of that film, and author Neil Gaiman himself will appear Saturday at noon to help celebrate. Various figures and props glow in eerie pink lighting (and some lit from within), and that red couch is purposely not as comfortable as it looks. 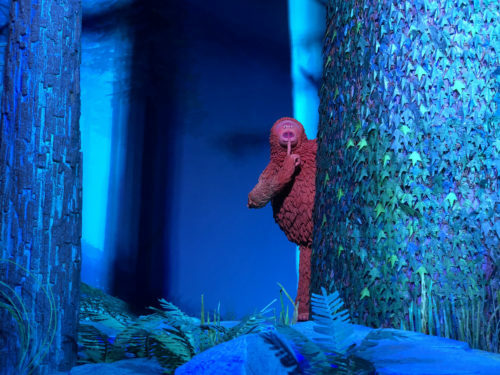 And then take a walk through the forest setting of LAIKA’s next film coming in Spring 2019 — The Missing Link. Zach Galiafanakis voices Mr. Link, but this character is expressive enough standing still. In this forest, each fern has armatures, so that they don’t even miss the detail of what a breeze blowing would do to each and every plant. If you didn’t have a sense of how much work goes into each film, you’ll walk out changed. 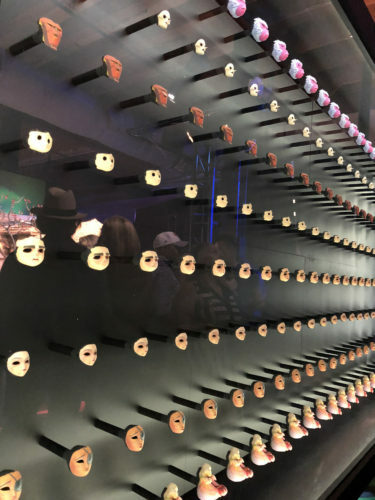 But hopefully still with some change, because the pop up store has all kinds of items from buttons (of course) and magnets, to t-shirts, figures, and prop replicas. 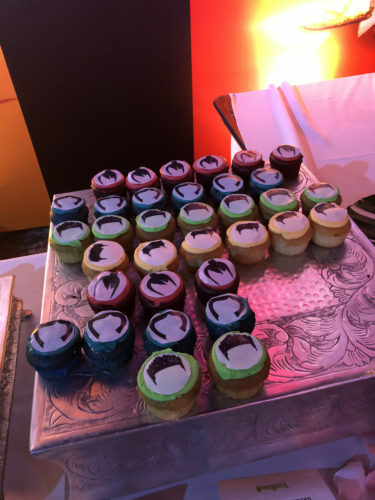 After going through it all, you might want to take some faces home with you. 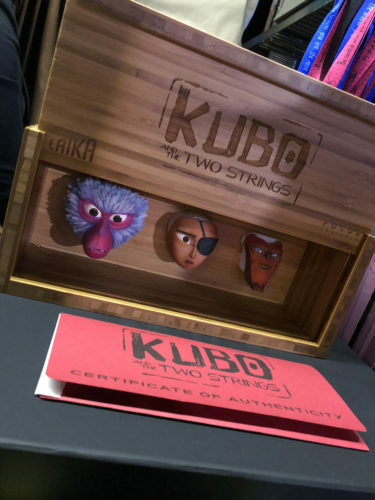 And there’s a promise of more memorabilia coming — 2019 may be a major marketing push for LAIKA, a brilliant studio that’s been 4 for 4, though maybe more with cult status than mainstream popularity. The Missing Link may break through, but in the meantime, you owe it to discover these gems if you haven’t already.